A culmination of blog posts on topics related to simulation and medical education. SiMEDucation at its finest. This critique on validity and how it relates to simulation teaching was written by Alia Dharamsi, a PGY 4 in Emergency Medicine at The University of Toronto and 2017 SHRED [Simulation, Health Sciences, Resuscitation for the Emergency Department] Fellow. When designing simulation exercises that will ultimately lead to the assessment and evaluation of a learner’s competency for a given skill, the validity of the simulation as a teaching tool should be addressed on a variety of levels. This is especially relevant when creating simulation exercises for competencies outside of the medical expert realm such as communication, team training and problem solving. As a budding resuscitationist and simulationist, understanding validity is vital to ensuring that the simulation exercises that I create are actually measuring what they intend to measure, that is, they are valid (Devitt et al.). As we look ahead to Competency Based Medical Education (CBME), it will become increasingly important to develop simulation exercises that are not only interesting and high-yield with respect to training residents in critical skills, but also have high validity with respect to reproducibility as well as translation of skills into real world resuscitation and patient care. scheme, the standard was that she should be able to tie the knot to completion (competency), leading to two loops at the end. I applied my simulation learning to this experience to asses the validity of this exercise in improving her ability to tie her laces. The test involved her tying these laces by herself without prompting. Face validity: Does this exercise appear to test the skills we want it to? Very similar to “at face value,” face validity is how much a test or exercise looks like it is going to measure what it intends to measure. This can be assessed by an “outsider” perspective, like her mom if she feels that this test could measure her child’s ability to tie a shoe. Whether this test works or not is not the concern of face validity, rather it is whether it looks like it will work (Andale). Her mom thought this exercise would be useful in learning how to tie shoes, so face validity was achieved. Content validity: Does the content of this test or exercise reflect the knowledge the learner needs to display? Content validity is the extent to which the content in the simulation exercise is relevant to what you are trying to evaluate (Hall, Pickett and Dagnone). Content validity requires an understanding of the content required to either learn a skill or perform a task. In Emergency Medicine, content validity is easily understood when considering a simulation exercise designed to teach learners to treat a Vfib arrest—the content is established by the ACLS guidelines, and best practices have been clearly laid out. For more nebulous skill sets (communication, complex resuscitations, rare but critical skills like bougie assisted cricothyroidotomies, problem solving, team training), the content is not as well defined, and may require surveys from experts, panels, and reviews by independent groups (Hall, Pickett and Dagnone). For my shoelace tying learner, the content was defined as being a single way to tie her shoelaces, however it did not include the initial lacing of the shoes or how to tell which shoe is right or left, and most importantly, the final test did not include these components. Had I tested her on lacing or appropriately choosing right or left, I would have not had content or face validity. This speaks to choosing appropriate objectives for a simulation exercise—objectives are the foundation upon which learners develop a scaffolding for their learning. If instructors are going to use simulation to evaluate learners, the objectives will need to clearly drive the content, and in turn the evaluation. Construct Validity: Is test structured in a way that actually measures what it claims to? In short, construct validity is assessing if you are measuring what you intend to measure. My hypothesis for our exercise was that any measurable improvement in her ability to tie her shoelaces would be attributable to the exercise, and that with this exercise she would improve her ability to complete the steps required to tie her shoelaces. At the beginning of the shoelace tying exercise, she could pick up the laces, one in each hand, and then looked at me mostly blankly for the next steps. At the end of the exercise and for the final “test,” she was able to hold the laces and complete the teepee so it’s “closed tight” without any prompting. The fact that she improved is evidence to support the construct, however construct validity is an iterative process and requires different forms of evaluation to prove the construct. To verify construct validity, other tests with similar qualities can be used. For this shoelace tying exercise, we might say that shoelace tying is a product of fine motor dexterity and fine motor dexterity theory states that as her ability to perform other dexterity based exercises (tying a bow, threading beads onto a string) improves, so would her performance in her test. To validate our construct, we could they perform the exercise over time and see if her performance improves as her motor skills develop, or compare her performance on the test to an older child/adult who would have better motor skills and would perform better on the test. External validity: Can the results of this exercise or study be generalized to other populations or settings, and if so, which ones? With this shoelace tying exercise, should the results be tested and a causal relationship be established between this exercise and ability to tie shoes, then the next step would be to see if the results can be generalized to other learners in different environments. This would require further study and a careful selection of participant groups and participants to reduce bias. This would also be an opportunity to vary the context of the exercise, level of difficulty, and to introduce variables to see if the cardboard model could be extrapolated to actual shoe tying. Internal validity: Is there another cause that explain my observation? With this exercise, her ability to tie laces improved over the course of the day. In order to measure internal validity, it is important to assess if any improvement or change in behaviour could be attributed to another external factor (Shuttleworth). For this exercise, there was only one instructor and one student in a consistent environment. If we had reproduced this exercise using a few novice shoelace tiers and a few different instructors it may add confounders to the experiment which would then make it less clear to assess if improvements in shoelace tying are attributed to the exercise or the instructors. Selection bias can also affect internal validity— for example selecting participants who were older (and therefore had more motor dexterity to begin with) or who had previous shoelace tying training would likely affect the outcome. For simulation exercises, internal validity can be confounded by multiple instructors, differences in the mannequin or simulation lab, as well as different instructor styles which may lead to differences in learning. Overcoming these challenges to internal validity is partly achieved by robust design, but also by repeating the exercise to ensure that the outcomes are reproducible across a wider variety of participants than the sample cohort. There are many types of validity, and robust research projects require an understanding of validity to guide the initial design of a study or exercise. Through this exercise in validity I was able to better take the somewhat abstract concepts of face validity and internal validity and ground them into practice through a relatively simple exercise. I have found that doing this has helped me form a foundation in validity theory, which I can now expand into evaluating the simulation exercises that I create. 1) Andale. “Face Validity: Definition and Examples.” Statistics How To. Statistics How to 2015. Web. October 20 2017. 2) Devitt, J. H., et al. “The Validity of Performance Assessments Using Simulation.” Anesthesiology 95.1 (2001): 36-42. Print. 3) Hall, A. K., W. Pickett, and J. D. Dagnone. “Development and Evaluation of a Simulation-Based Resuscitation Scenario Assessment Tool for Emergency Medicine Residents.” CJEM 14.3 (2012): 139-46. Print. This critique on simulation-based assessment was written by Alice Gray, a PGY 4 in Emergency Medicine at The University of Toronto and 2017 SHRED [Simulation, Health Sciences, Resuscitation for the Emergency Department] Fellow. You like to run simulations. You have become adept at creating innovative and insightful simulations. You have honed your skills in leading a constructive debrief. So what’s next? You now hope to be able to measure the impact of your simulation. How do you design a study to measure the effectiveness of your simulation on medical trainee education? There are numerous decisions to make when designing a sim-based assessment study. For example, who is included in the study? Do you use direct observation or videotape recording or both? Who will evaluate the trainees? How do you train your raters to achieve acceptable inter-rater reliability? What are you assessing – team-based performance or individual performance? Two commonly used sim-based assessment tools are Global Rating Scales (GRS) and Checklists. Here, these tools will be compared to evaluate their role for the assessment of simulation in medical education. Some of the pitfalls of GRS are that they can be quite subjective. They also rely on “expert” opinion in order to be able to grade learners effectively and reliably. Checklists, on the other hand, are thought to be less subjective, though some studies may argue this is false as the language used in the checklist can be subjective.10 If designed well, however, checklists provide clear step-by-step outlines for raters to mark observable behaviours. A well-designed checklist would be easy to administer so any teacher can use it (and not rely on experts to administer the tool). By measuring defined and specific behaviours, checklists may help to guide feedback to learners. With the move towards competency-based education, the use of simulation will play an important role in evaluating learners’ competencies. Simulation-based assessments allows for direct evaluation of individuals knowledge, technical skills, clinical reasoning, and teamwork. Assessment tools play an important component of medical education. An optimal assessment tool for evaluating simulation would be reliable, valid, comprehensive, and allow for discrimination between learners abilities. Global Rating Scales and Checklists each have their own advantages and pitfalls and each may be used for the assessment of specific outcome measures. Studies suggest that GRS have some important advantages over checklists, yet the evidence for checklists appears slightly improved than previously thought. Yet, whichever tool is chosen, it is critical to design and test the tool to ensure that it appropriately assesses the desired outcome. If feasible, using both a Checklist and Global Rating Scale would help to optimize the effectiveness of the sim-based education. This critique on simulation design was written by Alice Gray, a PGY 4 in Emergency Medicine at The University of Toronto and 2017 SHRED [Simulation, Health Sciences, Resuscitation for the Emergency Department] Fellow. Have you ever designed a simulation case for learners? If so, did you create your sim on a “cool case” that you saw? I think we have all been guilty of this; I know I have. Obviously a unique, interesting case should make for a good sim, right? And learning objectives can be created after the case creation? Recently, during my Simulation, Health Sciences and Resuscitation in the ED fellowship (SHRED), I have come to discover some theory and methods behind the madness of creating sim cases. And I have pleasantly discovered that rather than making things more complicated, having an approach to sim creation can not only help to guide meaningful educational goals but also makes life a whole lot easier! I find it helpful to think of sim development in the PRE-sim, DURING-sim, and POST-sim phases. Like many things, the bulk of the work and planning are required in the PRE phase. Next, simulation should be integrated into an overall curriculum to provide the opportunity to engage in repetitive (deliberate) practice:1 Simulation in isolation may not produce effective sustainable results.3 An overall curriculum development, while time consuming to develop and implement, is a worthy task. Having one simulation build upon others may improve learning through spaced repetition, varying context, delivery and level of difficulty. This can be difficult to achieve given constrained time, space and financial resources. Rather than repeat the same cases multiple times, Adler et al created cases that had overlapping themes; the content and learning objectives differed between the cases but they had similar outcome measures. 3 This strategy could be employed in curriculum design to enhance repeated exposure while limiting the number of total sessions required. Effective programmatic design should facilitate individualized learning and provide clinical variation: 1 Lioce et al, refer to a needs assessment as the foundation for any well-designed simulation.2 Simulation has addressed certain competencies residents are supposed to master – airway, toxicology, trauma, pediatrics, etc – without seeking input a priori on the learning needs of the residents. It may be valuable to survey participants and design simulations based on perceived curriculum gaps or learning objectives or try to assess baseline knowledge with structured assessment techniques prior to designing cases and curricula. (NB: Such a project is currently underway, led by simulation investigators at Sunnybrook Hospital in Toronto). The knowledge components can divided into the medical and critical resource management (CRM), or more preferably, non-technical skills. 5 Medical knowledge objectives are self-explanatory and should be based on the level of trainee. Non-technical skills objectives typically relate to team-based communication, leadership, resource utilization, situational awareness and problem solving.6 Kuuskne’s post makes the very salient point that we need to limit the number of objectives in both these domains as this can quickly overwhelm learners and decreased absorption of knowledge. The cognitive processes objectives can also be developed with increasing complexity, depending on the level of the trainee.4 For example, at the lowest level of learning is “remembering” – describing, naming, repeating, etc. At the highest levels of learning is “creating” – formulate, integrate, modify, etc. A case could be made to involve senior learners in creating and implementing their own sim cases. As part of creating scripts and cases, case designers should try to anticipate learner actions and pitfalls. There will always be surprises and unexpected actions (a good reason to trial, beta test and revise before deploying). On EMSimCases.com, Kuuskne outlines his approach to creating the case progression, and how can it be standardized.6 The patient in the simulation has a set of definite states: i.e. the condition of the patient created by vital signs and their clinical status.6 We can think of progression to different states through learner modifiers and triggers: Modifiers are actions that make a change in the patient, whereas triggers are actions that changes the state of the patient. I found this terminology helpful when outlining case progression. Simulation allows for standardization of learning in a controlled environment: 11 The truth of residency training is that even in the same program, residents will all have uniquely different experience. One resident ahead of me, at graduation, had taken part in 10 resuscitative thoracotomies. Many residents in the same class had not seen any. We cannot predict what walks through our doors but we can try to give residents the same baseline skills and knowledge to deal with whatever does. Feedback is provided during the learning experience1 unless in an exam-type setting, where it should be given after. It is important again to note the necessity of limiting the number of learning objectives, so you have room for scripted and unscripted topics of conversation. Debriefing the case should be a breeze, as it should flow from the case objectives created at the beginning. Going further than “the debrief” is the idea of how we evaluate the value of sim. To me, this is the most difficult and rarely done. Evaluation of each sim case should be sought from participants and stakeholders, in addition to the pilot testing. That information needs to be fed forward to make meaningful improvements in case design and implementation. Outcomes or benchmarks should be clearly defined and measured. The randomized study by Adler et al created clearly defined critical rating checklists during the development and needs assessment of their sim cases. 3 They then tested each case twice on residents to get feedback. In summary, although a “cool case” is always interesting, it doesn’t always make the best substrate for teaching and learning in the simulator. Thoughtful case creation for simulation needs to go beyond that, breaking down the design process into basic, known components and using a structured theory-based approach in order to achieve meaningful educational outcomes. 1 Issenberg et al. Features and uses of high-fidelity medical simulations that lead to effective learning: A BEME systematic review. Med Teach. 2005;27:10 –28. 2 Lioce et al. Standards of Best Practice: Simulation Standard IX: Simulation Design. Clinical Stimulation in Nursing. 2015;11:309-315. 3 Adler et al. Development and Evaluation of a Simulation-Based Pediatric Emergency Medicine Curriculum. Academic Medicine. 2009;84:935-941. This critique on simulation fidelity was written by Alia Dharamsi, a PGY 4 in Emergency Medicine at The University of Toronto and 2017 SHRED [Simulation, Health Sciences, Resuscitation for the Emergency Department] Fellow. That was the question I was pondering this week, as our SHRED theme this month is simulation in medical education. In my 4th year of residency at University of Toronto, most of my simulation training has been in one of our two simulation labs, using one of our three “high fidelity” mannequins. However, even though the simulation labs and equipment have been very consistent over the past few years, I have found a fluctuating attentiveness and “buy-in” to these simulation sessions: some have felt very real and have resulted in a measurable level of stress and urgency to improve the patient’s (read: mannequin’s) outcome while others have felt like a mandatory hoop through which to jump in order to pass a rotation. It should not come to anyone’s surprise to note that in Emergency Medicine, simulation is a necessary part of our development as residents. Simulation based medical education allows trainees to meet standards of care and training, mitigates risks to patients, develops clinical competencies, improves patient safety, aids in managing complex patient encounters, and protects patients . Furthermore, in emergency medicine, simulation has allowed me to practice rare and life-saving critical skills like cricothyroidotomies and thoracotomies before employing them in real-time resuscitations. Those who know me will tell you when it comes to simulation I fully support its use as an educational tool, but there does still seem to be an ebb and flow to how much I commit to each sim case that I participate in as a learner. During a CCU rotation, I was involved in a relatively simple “chest pain” simulation exercise. As the circulating resident, I was tasked with giving the patient ASA to chew. In that moment I didn’t just simulate giving ASA; I took the yellow lid from an epinephrine kit (it looked like a small circular tablet) and put it in the mannequin’s mouth asking him to chew it. I did not think much of it until our airway resident was preparing to intubate, and the whole case derailed into an “ airway foreign body” scenario—to the confusion of the simulationists sitting behind the window who didn’t know how that foreign body got into the airway in the first place. Why did I do that? I believe it’s because I bought into the scenario, and in my eyes that mannequin was my patient, and my patient needed the ASA to chew. The case of a chest pain—although derailed into a difficult airway case by my earnest delivery of medications—was in the context of a residency rotation where I was expected to manage the CCU independently overnight. That context allowed me to buy-into the case because I knew these skills were transferrable to my role as a CCU resident. My buy-in has had less to do with the mannequin and the physical space and everything to do with how the simulation fit into the greater context of my current training. There has been discussion amongst simulationists that there should be a frame shift away from fidelity and towards educational effectiveness: helping to engage learners, providing framework and context to aid them in suspending their disbelief, and providing structure to apply the simulation to real-time resuscitations in order to enhance learner engagement . The notion of functional fidelity is one that resonates with me as a budding simulationist; if a learner has an educational goal and is oriented to how the simulation will provide the context and platform to learn that goal, the learner may more easily “project fidelity onto the simulation scenario.” That is, the learner will buy-into the simulation . So how do we facilitate buy-in? We can start by orienting learners meaningfully and intentionally to the simulation exercises. This can be accomplished by demonstrating how the concepts from the simulation are transferrable to other contexts which can allow the learners to engage on a deeper level with the simulation and see the greater applicability of what they are learning . We can’t assume learners understand why or how this exercise is applicable to them. A chest pain case for a senior resident in emergency medicine has very different learning outcomes than the same case for an off service junior resident rotating through the ER; the same can be said for a resident primarily working in the hospital or working in an outpatient clinic. Tailoring case objectives to learners specifically provides an opportunity to provide relevant skills to learners in the context of their training, giving them a reason to buy-in to the scenario session. Moving beyond “to learn…” or “to outline the management of…”, I would advocate that specifically outlining objectives for the level and specialties of participating learners will help them see the employability of the skills they gain in the simulation. We can also use those specific objectives and context we start the simulation session with to foster a more directed debrief. The post-simulation discussion should not only cover medical management principles but also specific discussion about what learners would do if they encountered a similar situation in their specific work environment (clinic, ward, etc), transferring the learning out of the simulation lab and into real world medical practice. If we are going to see simulation as a tool, let’s see it as one of those fancy screwdrivers with multiple bits, and stop trying to use the screwdriver handle as a hammer for every nail. No one mannequin, regardless of how expensive and how many fancy features it has, can replace the role of a thoughtful facilitator who can help learners buy-into the simulation. If facilitators take the time to orient the learner to their specific learning objectives and then reinforce that context in the debrief discussion, they can increase the functional fidelity of the session and aid learners in maximizing their benefit from each simulation experience. This week’s post is written by Dr. Cheryl ffrench. She is the Director of Simulation for the Department of Emergency Medicine at the University of Manitoba and is also one of the advisory board members for EMSimCases. Emergency Medicine is a very sensory specialty. Walking into the resuscitation room, the appearance, sound and sometimes smell of the patient provides a wealth of information before introductions are even made. Recognition of the “sick” patient is something we strive to teach our residents and medical students. Simulation is an excellent tool to help teach core emergency medicine skills. The principles of crisis resource management are essential to the practice of emergency medicine and simulation provides us with an excellent tool to bring them to light. However when the simulation stem describes an 80 year old female patient in respiratory failure and the learners walk into a room to find a manikin that more closely resembles a 25 year old Arnold Schwarzneger, despite being asked to suspend their disbelief, their approach to the patient can’t help but be different. Similarly when asked to assess the trauma patient, the visual cues of finding the stab wound or open fracture help to re-enforce both their clinical skills and the simulation experience. Most manikins used in simulation today are large robust health males in the prime of their simulated lives. However, this does not reflect the patient population of most emergency practices. Simple measures can turn a “he” into a “she” like remembering to exchange the external genitalia and adding a simple wig. Suddenly the patient has a more feminine appearance that reflects the other 50% of our patient population. A grey wig can make him (or her) age to an extent but investing in some costume masks found at any party store can take the manikin’s healthy 25 year old skin and give the illusion of a face wrinkled by time. These masks fit most standard adult size manikins. The softer and more form fitting the mask, the nicer it is for the learner to work with when intubating but even the less pliable masks have little impact on airway management so long as they come with an open mouth on the mask. The wounds and injuries that our trauma patient present with often dictate our index of suspicion for the severity of their illness and thus our level of concern. Seeing the bleeding wound in the centre of the chest or over the anterior neck raises a level of anxiety and serves as a constant reminder of the seriousness of the trauma. That is difficult to create if the learners are simply told by the confederate that there is a “big stab wound” or an “expanding hematoma” as these findings can be easily lost or forgotten without the visual reminder in the midst of a chaotic simulation case. Stab wounds can be easily added with some basic halloween “wounds” found at any halloween or party store. For the more creative, they can also be even more realistic though some simple techniques that are described at the end of this blog. The placement of a pregnant abdomen on the trauma patient provides another prompt for the unique management principles for that patient population. Place a fetal manikin in the belly and suddenly you have a perimortum csection case that will never be forgotten. 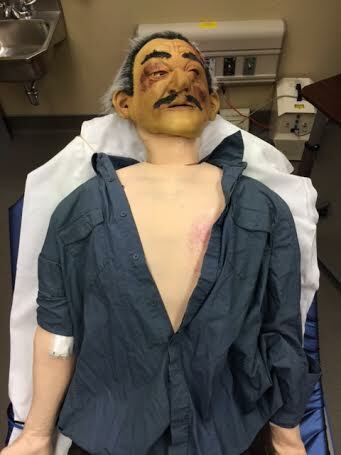 Bubble wrap underneath the skin on the manikin’s neck creates the textile feel of subcutaneous emphysema which if also moulaged with bruising on the skin provides your learners with a frightening airway scenario that keeps most emergency practioners up at night. Moulage combined with either the use of preset vocals or some voice over acting will help to create a unique emergency medicine simulation experience that your learners won’t soon forget. Wipe the area for application with a thin layer of Vaseline or baby oil. Lightly wipe again with a dry cloth to remove excess oil. Apply makeup lightly and avoid rubbing it into the pores of the skin. Avoid putting the makeup on until as late as possible. Leaving the colours on for extended periods of time increases the probability of a stain. As much as possible, use only products provided or sanctioned by the mannequin company. Be particularly careful when using red or blue based makeup as they stain the most. Remove the moulage as soon as possible after use, and clean the area with mannequin cleaner to remove the oils. All photos courtesy of Cheryl ffrench and Jane Fedoruk. Simulation without debriefing is really just an expensive way of either making learners feel badly about themselves or allowing learners to practice performing poorly. This is why the theory behind debriefing is so important. Debriefing is one of the most amazing teaching tools available to an instructor. Debriefing allows insight into a learner’s thought process such that an instructor can tailor teaching to a learner’s specific needs. Kolb’s learning cycle1 and Schonn’s description of the Reflective Practitioner2 allow us to see why debriefing is such a useful tool. We must actively reflect on an experience to learn from it; debriefing allows educators to help guide that reflection. While debriefing is arguably the most important component of simulation education, it is also a difficult skill to acquire. Eppich and Cheng3 have published an excellent approach to debriefing that reviews many of the key steps a novice simulation educator should aim to follow. They have called it the PEARLS approach (Promoting Excellence and Reflective Learning in Simulation). We will review its four phases here. This is where learners are invited to express their raw feelings about the case. Often, learners will do this without a formal invitation (for example, you may hear initial reactions while walking from the simulator to the debriefing room). It is important to invite all learners to have a chance to vent during this stage. This phase begins by asking a learner to describe what they think the case was about. This allows the educator and the learners to see if they are on the same page. Often, this leads to important issues for discussion during the next phase. Here, the educator must tailor their style of debriefing to suit both the learners in the room and the time available for the debriefing. This phase is what educators often think about when they envision debriefing. Essentially, the analysis phase is where learners can go through guided reflection. There are two common styles of guided reflection described. The first is the +/Δ method. This involves probing learners as to what went well (the +) and what could be improved or changed for the future (the Δ). Many who are new to debriefing find themselves turning to this style at first. A second, commonly used style is called advocacy/inquiry.4 This approach leads to incredible insights into the knowledge and performance of the learners. It can be somewhat more challenging to execute well. The basic premise is that one must first describe a noted performance gap. This is followed by a question as to the learner’s frame of mind at the time of the performance. The learner’s answer leads the instructor as to what learning points may need to be addressed. Sometimes, the entire room of learners is unsure of a next appropriate step in management. In this case, the debriefer must simply provide directed teaching. In other cases, the learner has made a slight cognitive error. Often, these can be addressed through facilitated discussion with other learners. Once the group has gone through all the desired learning objectives in the analysis phase, it is imperative that the instructor guides a review of key points related to the objectives. If time is short, the instructor can provide the summary himself. If time is more abundant, it can be useful to have the learners go through their key learning points. As we can see, a fair amount of effort is required to facilitate an excellent debrief. With frameworks like the PEARLS approach, experienced and inexperienced educators alike have a practical means upon which to build their debriefing skills. What tips and tricks do you use in your debriefing? Kolb DA. Experiential earning: experience as the source of learning and development. Englewood Cliffs, NJ: Prentice Hall; 1984. Schon D. The Reflective Practitioner: How Professionals Think in Practice. New York: Basic Books. 1983. Eppich, W., Cheng, A. Promoting excellence and reflective learning in simulation (PEARLS). Simul Healthc. 2015:1. doi:10.1097/SIH.0000000000000072. Rudolph, JW., Simon R., Rivard P., Dufresne RL., Raemer, DB. Debriefing with good judgment: combining rigorous feedback with genuine inquiry. Anesthesiol Clin. 2007;25(2):361-376.